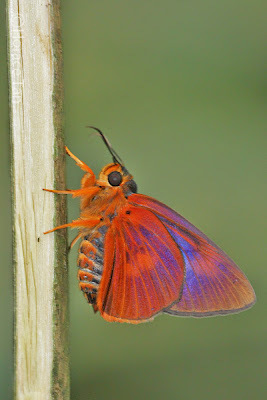 Burara etelka (The Great Orange Awlet) is a rather large species with the wingspan up to 1cm longer than the look-alike and more common species, Burara harisa (The Orange Awlet). Above, the male is dark brown with no brand; the female is dark brown with basal halves of all wings shining greenish blue. 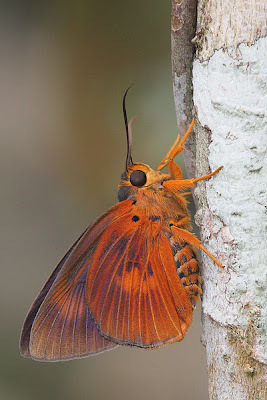 Underneath, both sexes are shaded orange with the hindwings particularly so. Basal halves of the forewings are shaded purplish blue, more extensive and shining in the female. Both sexes have orange tornal cilia on the hindwings. 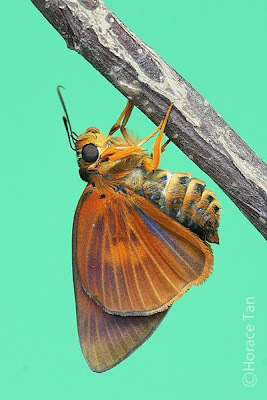 The head, legs and the ventral surface of the the thorax are colored orange. 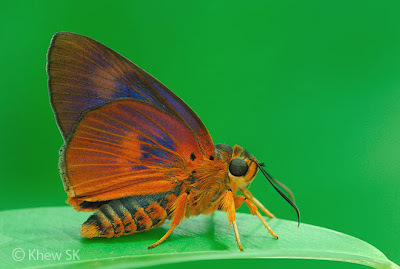 Numerous orange hairs are also featured on the thorax and abdominal segments. Two Burara etelka resting on stems in the nature reserve. 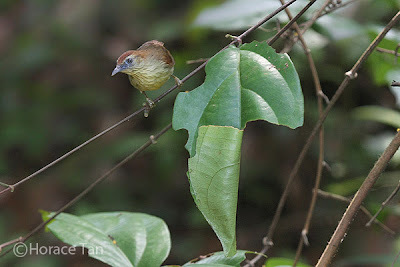 Another Burara etelka found in the nature reserve. 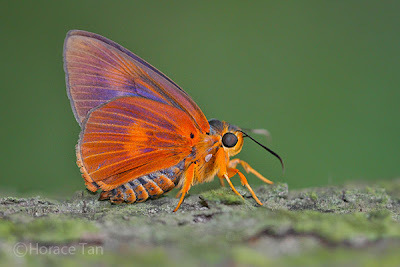 The adult of this species is rarely encountered in Singapore, due likely to their habit of being more active at dawn and dusk. In contrast, the caterpillars are more readily found in leaf shelters on its host plant, Combretum sundaicum, which is a common creeping weed in the Central Catchment Nature Reserve. 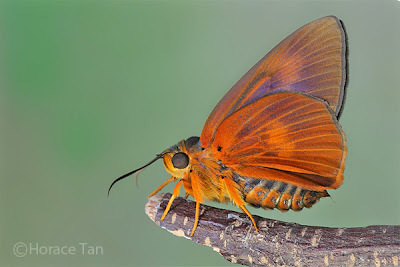 As typical with other skippers, the adults fly with swift, strong and darting flights. 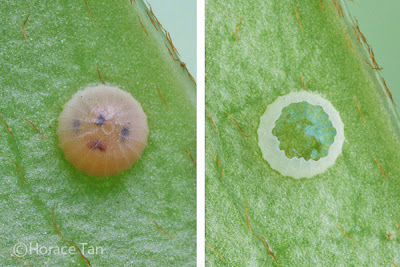 The eggs are laid singly on the leaf upperside of a middle-aged or mature leaf of the host plant. Each egg is creamy white with a beige tinge. It is dome-shaped with a flat base. The micropylar sits atop and a number of vertical ridges running longitudinally from it. The diameter is about 1.2mm. It takes 3 days for the collected egg to hatch. The young caterpillar eats just enough of the shell to emerge, and has a length of about 3mm. Its pale brown body is cylindrical in shape with rather long lateral and sub-spiracular white setae. The large head is pale brown with black markings and bears similar white setae as those on the body. 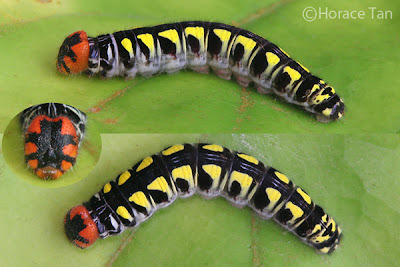 All instars of Burara etelka caterpillars feed on either the middle-aged or mature leaves of Combretum sundaicum, and ignore the young and tender leaves on new shoots. The body soon takes on a green undertone after a few feeding sessions on the leaf. Its movement on leaf was observed to be rather quick-paced. As the growth continues in this first instar, faint lateral markings start to appear. 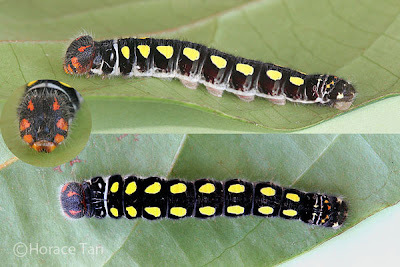 By the time the caterpillar lies dormant for its moult to the 2nd instar, its length has reached 6mm and black rings are discernible on the body, one to each segment. The 1st instar takes a total of 2 days to complete. 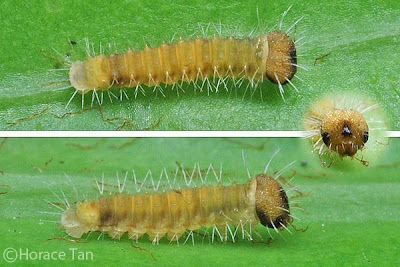 1st instar caterpillar, late in this stage, length:6mm. 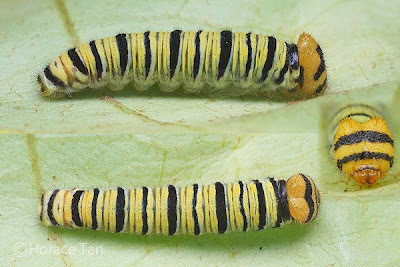 The body of the 2nd instar caterpillar has a ringed appearance with a black ring of irregular thickness and 4-5 white and yellow rings on each segment. The head is pale orange with two horizontal black stripes. Both the head and the body also feature short white setae. This instar lasts a total of 3 days with the body length reaching about 11-12mm. 2nd instar caterpillar, late in this stage. Lengths: 10mm (top); 12mm (bottom). 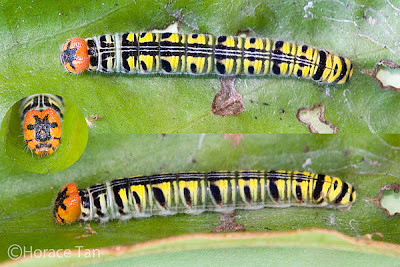 The 3nd instar caterpillar resembles the 2nd instar caterpillar closely in markings and coloration. This instar lasts a total of 3-5 days with the body length reaching about 18-19mm. 3rd instar caterpillar, early in this stage. Length: 11.5mm. 3nd instar caterpillar, late in this stage. Length: 14mm. 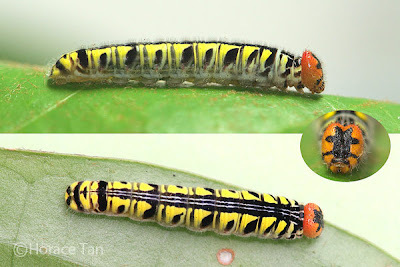 The 4th instar caterpillar is bright yellow in body color. A prominent and broad dorsal black stripe, running from the prothorax to the 7th abdominal segment, is featured with two finer white band embedded within. Each body segment has a large and irregularly-shaped black spot laterally, of which several are connected to the dorsal stripe. The head is orange with a broad black central and vertical stripe (split at upper end) crossed by two black horizontal stripes, giving it a close resemblance to some Chinese Opera masks. Both the body and the head also sport numerous short setae. This instar lasts 3-5 days with the body length reaching up to 28-29mm. 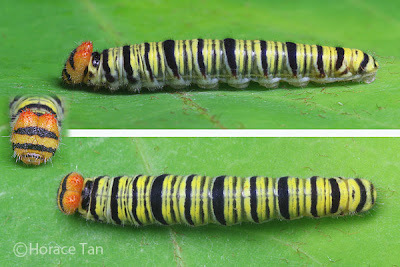 The 5th instar caterpillar has similar body color and markings to the 4th instar caterpillar with the only discernible difference being a greater proportion of black in the dorsal band, lateral body spots and head stripes. This instar takes about 4-6 days to complete with the body length reaching 37-38mm. 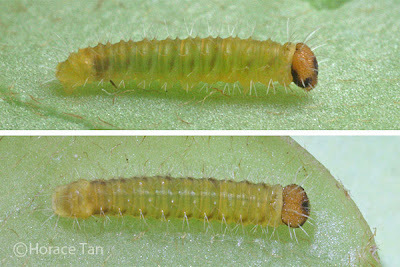 Two views of a 5th instar caterpillar, early in this stage. Length: 26mm. As is typical of most hesperiid species, the caterpillars of Burara etelka also build leaf shelters on the host plant. 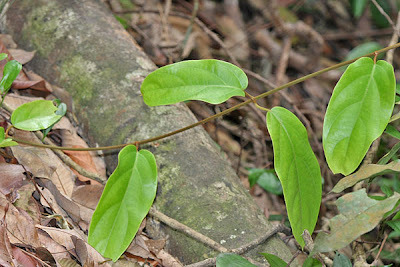 Typically a fragment of the leaf lamina is cut and folded inwards and secured with silk threads to create a sufficiently large void of space in which the caterpillar rests and hides between feeds. reserve with a bird paying close attention to it nearby. 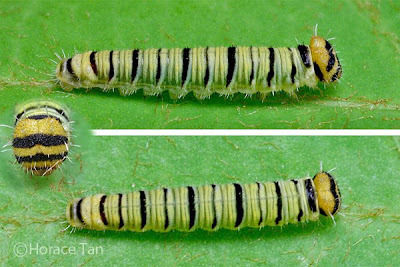 A short sequence of a 5th instar caterpillar chomping on leaf lamina. 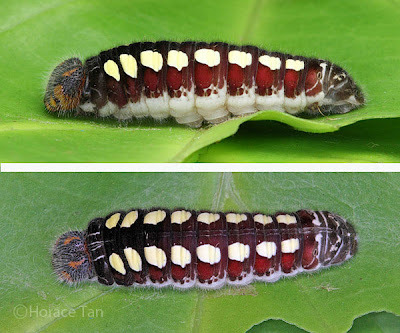 The 6th and final instar caterpillar continues the increase of the proportion of the dark color in various markings to the extent that the dark color switches its role to become the base color. Now yellow color is confined to oval lateral spots, a pair to each body segment. The dark base color reveals itself as dark reddish brown upon closer look. Again, numerous short and white setae covers the body and the head. This stage takes about 9-12 days to complete with the body length reaching 65-66mm. from the 3rd to the 6th instar (left to right). 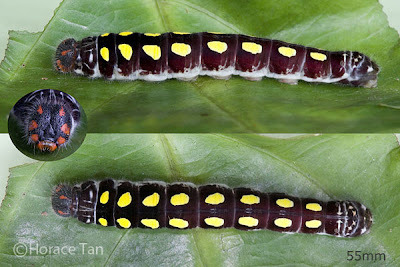 At the end of 6th instar, the body of the caterpillar shortens rather drastically to about 35mm in length. Soon it becomes dormant in its leaf shelter and enters the prepupatory phase which lasts for one day. 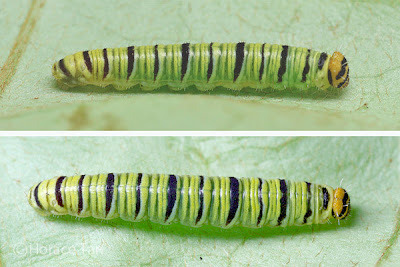 Two views of a pre-pupa of Burara etelka. Pupation takes place within the leaf shelter. 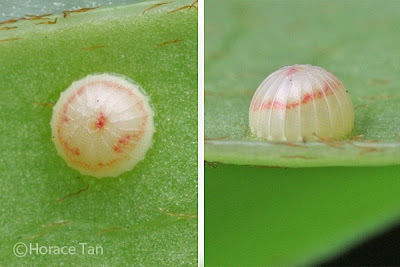 The pupa secures itself with its cremaster attached to a short transverse band on the leaf surface, and has a silk girdle. It has a short thorax, a rather long abdomen, a short and pointed rostrum. The body is initially pale pink to purplish with large yellow lateral spots and black markings. However within a day all yellow spots fade away with the base color becoming milky white. 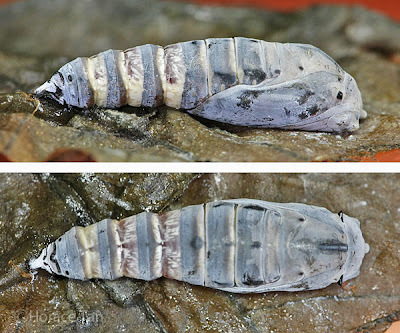 Length of pupae: 30-32mm. 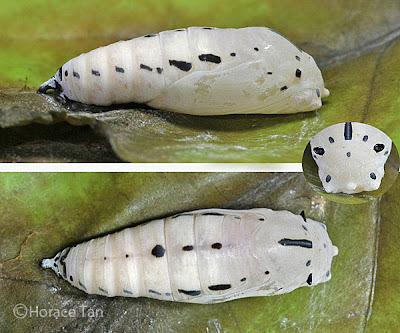 After 9 days, the pupa becomes mostly black in color in the wing pads and in the body segments. Eclosion takes place the next day. 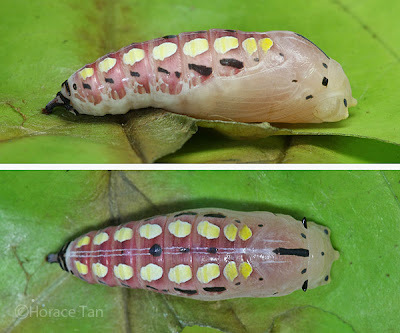 Two views of a mature pupa of Burara etelka, shortly before the eclosion event. A newly eclosed Burara etelka drying its wings. Note: The above life history record is based on observations of three larvae collected and bred over their last three instars, yet another over its last five instars, and one bred from a collected egg, on five separate occasions over a period of 1.5 years. Six instars were evident in the last two larvae bred. 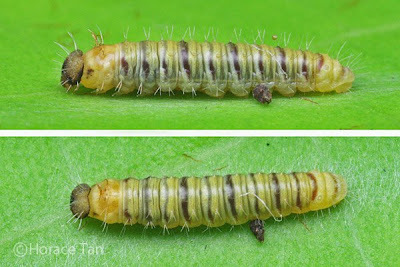 However this does not preclude the possibility of utilization of five instars, typically of most hesperiid speces, in other Burara etelka larvae.